You will receive a secure user name and password to access the writing website to help manage your classroom writing. Upon logging in, you can change your password, access the Help page, adjust personal display settings, sign out to return to the Welcome page, and access the four main action tabs: Home, Lessons, Practice, and Portfolio. The course home page displays important information about this course including Helpful Links, Writing History, and the four main tabs for working in the course. Click Guides to view the 2 Stars and a Wish guide. Click Rubrics to view PEG's scoring rubrics for the Six Characteristics of Writing and constructed response essays, as well as teacher-scored rubrics for textual evidence and content accuracy. Click Change Course to view the Select a Course page and choose a different course or sign up for a new course. Click the Home tab to return to the course homepage. Click the Lessons tab to access writing lessons and practice exercises. Click the Practice tab to select a prompt, and then plan, write, revise, and submit writing to be scored. Click the Portfolio tab to view your writing score averages and access your score reports. 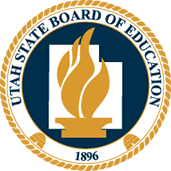 Students are pre-registered for courses in Utah Compose and are updated nightly. If you have more than one course, the Select a Course page displays all of the courses that are registered to your login credentials. The Registered Courses table lists each course by Course Name and Status. Select a course by clicking on the course name. This will take you to the home page for this course. To change courses, click the course name drop-down menu in the left corner of the page. Click See All to return to the Select a Course page. You can also return to the Select a Course page by clicking on the Change Course link at the bottom of each page. The Writing History table contains information and links to access your most recent writing drafts. 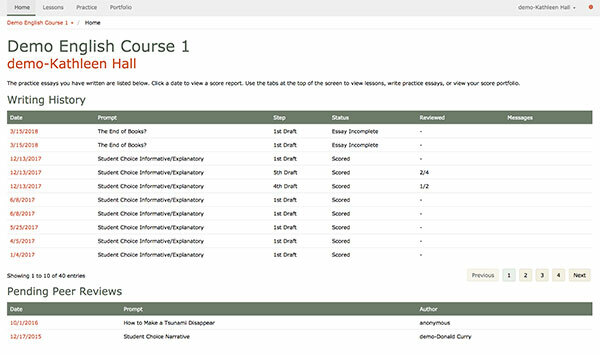 The table lists the date, prompt title, step the status of the draft (scored or incomplete), the number of reviews completed for a requested peer review, and messages from your teacher. There are 10 essays listed on the page at a time. Use the Previous, Next, and Page Number buttons to navigate to additional essays. Click the Date Link to view the Score Report for the specified prompt. Click the Messages Link to read and write comments to your teacher within the score report. The Pending Peer Reviews table is located below your Writing History table. This table displays peer review requests that you have received from one of your fellow group members, including the date the review was requested, the name of the prompt on which the author wrote the essay, and the name of the student author who wrote the essay and requested your review. Click the Date link to read, complete, and submit the Peer Review.